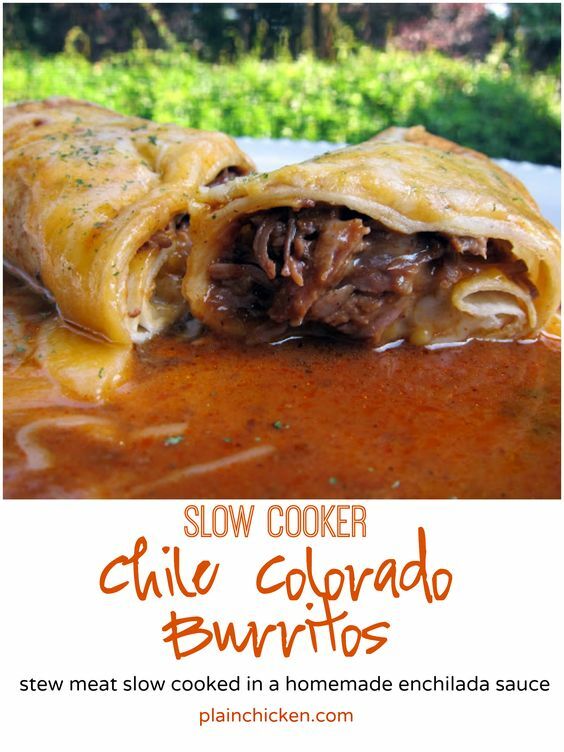 Slow Cooker Chile Colorado Burritos - stew meat slow cooked in a homemade enchilada sauce - wrap meat in tortillas and top with cheese to serve. OMG! AMAZING! We always double the recipe for leftovers. I love this idea Stephanie. I'm not familiar with Knorr's Caldo de Tomate. Is this something dry in the spice section, or canned from the Mexican food section? Yes you can find it in the Mexican food aisle. Looking forward to trying this! Yum! This looks great. I just love Pinterest! I prefer homemade enchilada sauce too, taste SOOOOOO much better. But your version is way faster and much easier than Alton Brown's version that I use. Have you tried Knorr's chipotle cubes? Those little things are awesome. I have not seen the chipotle cubes - I will look for them at the store this weekend! that sauce really looks good. This looks awesome and sounds really simple. Isn't it amazing? I also tried this when I found the recipe on Pinterest. I used Knorr's gel boullion and it was amazing!! I am anxious to try your homemade enchilada sauce! Angee - the homemade enchilada sauce is life changing! You will never use enchilada sauce from the can again! Teresa - the Knorr's Caldo de Tomate is in the Mexican food section of the grocery store. It is a tomato/chicken bouillon. It is great for Mexican sauces and rice. Was the beef stew meat easy to shred after 8 hours in the crock pot? Can't wait to try this over the weekend! Carrie - the meat just fell apart! It was very tender. I made these Friday, they turned out great...didn't find Knorr's, but a similar product, I assume, just in another brand. I will definitely make these again. I used London Broil, still somewhat froze, covered it in the enchilada sauce, set it to low about 8:30am, turned it up that night to high for about 2 hours, and it was incredibly tender and tasty. I'm having a hard time finding the Knorr's Caldo de Tomate. Can you all post the substitutions you made? Would Whole Foods have it? I haven't checked there yet. I have checked at Publix, Winn Dixie, World Market and Target- no luck. I bought the Goya SOFRITO Tomato cooking base, but not sure if it will work? Made these tonight for friends coming over and they turned out great! We're in Texas, so I easily found the caldo de tomate at the Hispanic grocery store (Fiesta). Thanks for the delicious recipe! I just looked up the ingredients and The second ingredient in Caldo de Tomate is MSG. That is scary. I have made homemade enchilada sauce from scratch and it is heavenly. It's simple too and can be frozen. Dried peppers soaked in hot water and blended with onions and spices. Google it I'm sure there are tons of recipes. I wanted to know if you think these will be good if I use chicken instead of the stew beef? Maybe a combo of boneless skinless breasts and boneless skinless thighs. I would love to serve these this weekend at a party. I think the combo of chicken thighs and breasts would be great. Let us know how it turns out! Oh! Also, I voted for your Skillet Lasagna. That recipe sounds amazing! Good Luck! This was so good! My husband went crazy for this! The meat was super tender and the sauce was great. I made it into a dip, 8x8" dish with refried beans on the bottom, then 1/2 the meat with lots of sauce and then cheese on top. Baked it for a bit and it was divine! Can't wait to try the burritos next time. Thanks for an awesome recipe! I'm looking for things to make while my sister is here. I copied this and hope to try it soon. This recipe was a hit! Loved that I could make it in the crock-pot. We really enjoyed the burritos. Both my husband and my son had 3 each! This dish is excellent! The whole family said it is a re-do for sure. Super easy & extra tasty. I added some ground cumin to the sauce (I love the flavor). I will be making the sauce in a big batch & freezing some for even more ease. Is there anything i can substitute for the caldo de tomate? About how many does this recipe serve? Would LOVE to try this, but I have a family of 6 to feed! Candice - it all depends on everybody's appetite, but I think this is plenty of food for 6 people. Sorry, but being from New Mexico, this sauce was way too tex mex for my taste. I will make it again using tradional NM red chile sauce. The meat done in the crock pot did turn out delicious, though! I made this for the first time in April 2013 and I've lost track of how many times I've made it since. It's in the crock pot now! Definitely a favorite around here. Such a simple recipe, yet it's amazingly delicious! I used a 2 lb bottom round roast and it came out great! The kids even enjoyed this dish. I unfortunately didn't get to try with the home made enchilada sauce. As it turns out Knorr's Caldo de Tomate is just not available in my area. I will be ordering it from Amazon so I can try it. I substituted store bought enchilada sauce. It still came out wonderful, but I want to try the home made sauce as I'm sure it's MUCH better.